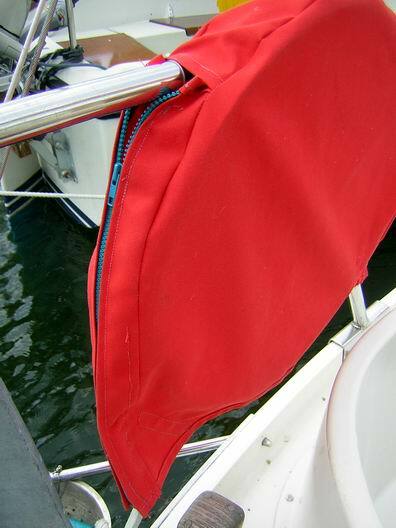 A sun cover for reeled mooring tape. A very popular type of anchor rode/mooring warps combination on Scandinavian yacths is made from 25 or 35mm wide woven polyester tape. It is just as strong as, say, the 12-14mm braided line typically used for rodes, warps or springs (the strength of the tape is claimed to be 1500 or 2500 kg when new). There are at least two brands, the all stainless steel Hawa© and the rather more plasticky Ankarolina©. 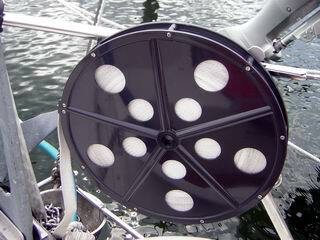 They have the great advantage of being easily "windable" onto a purpose-made reels using a regular winch handle. They have the distinct disadvantage (in common with most other synthetic lines) of being sensitive to UV rays. When a reel is mounted to a pulpit (or pushpit) the tape will sit in the sun all the time, and its strength is bound to degrade quicker than usual. 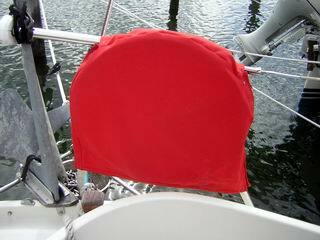 This simple canvas cover hopefully solves the problem of premature aging from excessive sun exposure. In order to fit snugly on both sides of the reel (including parts of the trail to which is attached) it has to be zippered or "velcroed" as shown. The 56 meter Ankarolina spool. Ankarband av typ Ankarolina eller Hawa har blivit väldigt populära på alla slags båtar, åtminstone i svenska farvatten. Problemet med att polyesterbandet tenderar att försvagas p g a ständig solexponering har diskuterats mycket. Det är ingen tvekan om att UV-strålning inte är bra fär något slags tågvirke. Ett sätt att undvika problemet är att skydda bandspolen från den mesta av den skadliga solstrålningen. På bilderna visas ett enkelt kapell som man ganska lätt syr själv. Beroende på hur montaget av rullen ser ut får det anpassas lite grand. Jag satte ett par blixtlås längs kanterna och lite velcro som håller ihop sidorna undertill.